Home > Tips > What Can a Hyperthyroid Cat Eat? What Can a Hyperthyroid Cat Eat? If your cat suffers from hyperthyroidism, one main concern you should have is with their diet. In fact, it’s totally natural that you would want to ask what can a hyperthyroid cat eat. 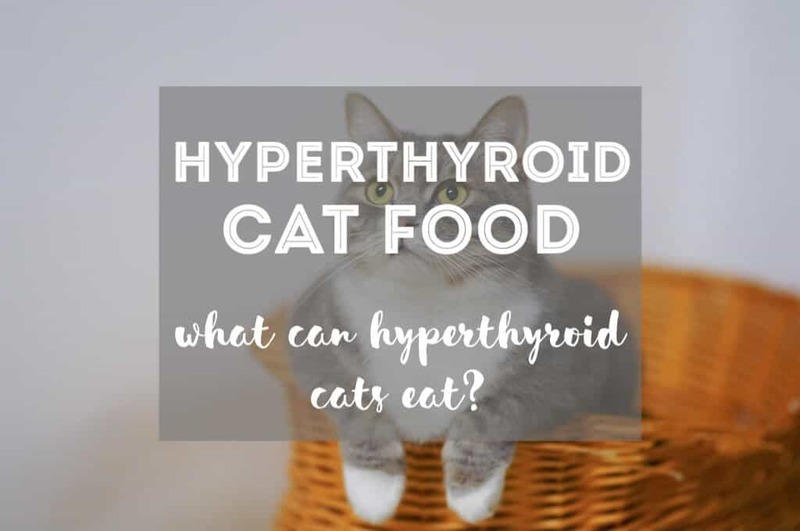 Because the disease is associated primarily with their weight and metabolism, finding out what a hyperthyroid cat can eat will play a big role in helping them manage their hyperthyroidism. Cats with hyperthyroidism will need a specialized diet to counteract the amount of energy burned by the condition. 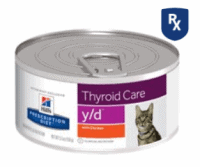 Hyperthyroid pet food is available online as well as by prescription. Typically, cat food for cats with hyperthyroidism have a reduced level of iodine while also remaining nutritionally balanced. Hills cat food is one of the main purveyors of great cat food for cats with medical conditions. This hyperthyroid-specific product is no different in that regard. 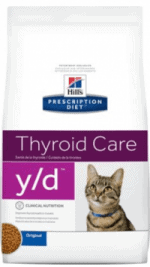 Their line of cat food for hyperthyroid cats is clinically proven to improve thyroid health in just 3 weeks. Supports kidney, heart, and urinary health. With low sodium and potassium levels, this food works to control kidney and bladder health, while guaranteeing to rebalance thyroid levels. 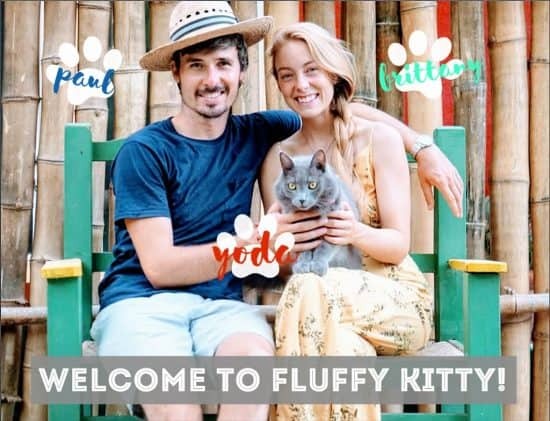 It also contains fatty acids and omega-3 oils, which will help to maintain your cat’s coat health, which may have suffered during any periods of hyperthyroidism. The best-canned cat food for hyperthyroid cats is also produced by Hills. If you have a cat that prefers wet food over dry, their y/d Feline Thyroid Care Product is most suitable. As with the dry food option, this canned hyperthyroid food also contains taurine and carnitine to promote your cat’s heart health and prevent further tachycardia. You may find this to be the best canned cat food for hyperthyroid cats. If you’re looking for a natural alternative, we find that the best natural food for cats with hyperthyroidism are often supplements. Instead of a whole dietary upheaval, which can also cause digestion problems or general fussiness, the antioxidant properties of the herbs contained in this natural hyperthyroid support balance the thyroid while also regulating appetite, thirstiness, and urination patterns. 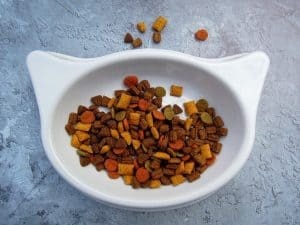 As with all medicated food and products, hyperthyroid-specific cat food can often be more expensive than your store-bought, branded variety. 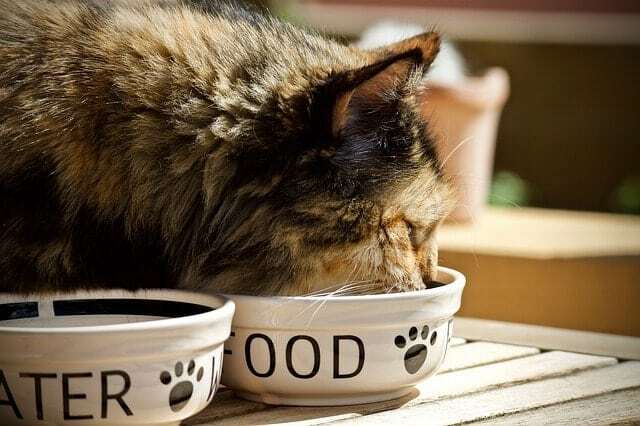 It is possible to, and some owners prefer to, provide homemade food options for your cat (please talk to your vet first). By carefully managing their nutritional intake, it is possible to put together an effective diet. You may wish to do this if you want to avoid big-name brands, or simply can’t afford them. Even so, you should aim to emulate the basic ingredients of other products, such as Hill’s brand of hyperthyroid cat food. To put it simply: you should aim for a high-protein, low-carbohydrate diet (1). Feeding animal-sources of protein, meat (including richer sources such as liver) will help to maintain muscle strength and restoration. As hyperthyroidism reduces muscle mass, these kinds of protein-rich foods should be prioritized. You should try to avoid grains and vegetables based foods, or kibble toppers as they provide a lower nutritional value. Nature’s Variety Instinct, and their RAW selection, a good selection of protein-rich meals that use natural ingredients to aid in digestion. The direct, natural protein also avoids additives that may cause upset stomachs for more sensitive cats. The key thing you should keep in mind when creating a homemade meal is to reduce iodine levels. But beware. You should be careful if looking to start them on an iodine-restrictive balance as feeding too little has also been known to exacerbate a hyperthyroidism condition. 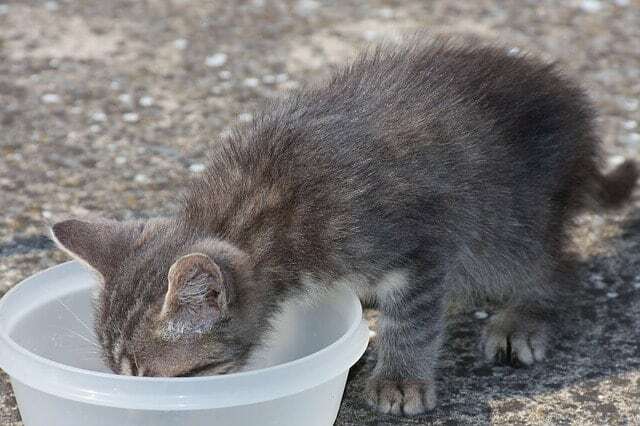 Many cat food products contain high levels of iodine (2) including salt, fish products including kelp, cured meats and certain fish oils including cod liver oil. Make sure to speak to a vet about your cat’s condition before making changes to its diet. Learn more about hyperthyroidism in cats below. Hyperthyroidism in cats is characterized (in external measures) by weight loss and an increased metabolism, but there are other symptoms that you may find harder to spot. Those we will describe below. Hyperthyroidism in cats is an issue that arises when the thyroid glands produce excessive thyroxine – the thyroid hormone (3). This hormone is used to control metabolic rate among other processes, but can also be a mood regulator, so behavioral changes may be a sign of this as well. Hyperthyroidism in cats is very common; occuring in over 10% of cats 10 years and older. Enlargements of the gland can be due to a change, or growth in the body not unlike the development of a tumor (4). If that sounds scary, you should know that this is a benign change that rarely develops into malignant cancer. It does also mean, however, that without proper medical treatment that this condition will not go away. What it does mean is that you will have to adjust your cat’s lifestyle to treat this condition. If you fail to do so, it can have fatal consequences. The first thing you should do is be sure it is indeed feline hyperthyroidism. Hyperthyroid cats tend to be older (7+ years), and your cat can be equally affected whether it is male or female. But how do you know you have a hyperthyroid cat? As mentioned before, your cat will start burning more energy even if the diet you give them hasn’t changed. Their metabolic rate will increase, and along with this, they will have an increased appetite (despite weight loss). As we have mentioned, you will need then to look at what a hyperthyroid cat can eat. 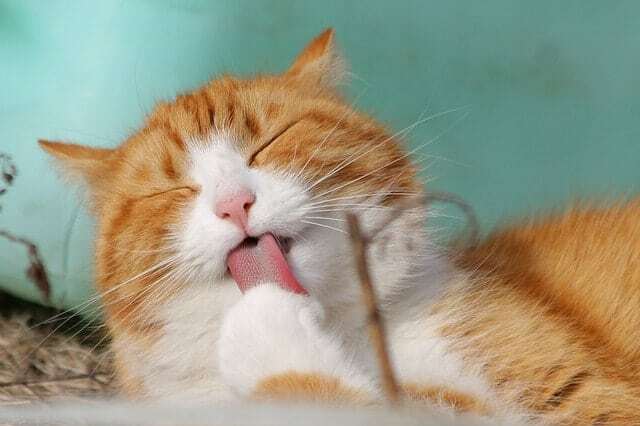 Your cat’s coat will start to look greasy, or unkempt. For most owners, this is the first sign something is wrong. Coat health is associated with a number of things so you may have trouble diagnosing feline hyperthyroidism from just this indicator. The thyroid glands regulate moods. Your cat may demonstrate an increase in their aggressive tendencies. This sometimes combines with a break in their toilet habits and you may see them making more of a mess than usual. This is known as inappropriate elimination. They may also demonstrate increased affection, and show signs of increased restlessness. Vomiting is often a common symptom. This may also be accompanied by diarrhea. You may find that your cat will seek out cooler places to sit in cases where they are overheating. also known as tachycardia. You may notice that this is linked to a change in behavior. You may have trouble diagnosing this yourself without the proper equipment but look for signs of panting and rapid breathing. Blindness: In some very severe cases, your cat may experience blindness. This is caused by an increase in blood pressure which can detach their retinas. Whatever the case may be, if you notice any change in your cat’s mood, behavior, eating habits, or overall health, the first thing you should do is talk to your vet. Your vet will likely take a blood test to confirm the abundance the hormone present in their blood, and you will be able to move on from there. Luckily, cats with hyperthyroidism don’t have to experience a reduced life expectancy, or indeed a reduction in their quality of life. Thanks to additional research, a wider range of products and advice are made available to pet parents with hyperthyroid cats. Luckily, us cat owners are finding that their pets are living to their normal lifespan with proper treatment. If left untreated, however, your cat can experience difficulties beyond their hyperthyroidism. Due to the fact that it is a common problem, hyperthyroidism in cats is manageable at home, though further steps to cure it will require medical intervention. Surgery and radioactive iodine therapy are recommended as the best cures for the condition. They target the abnormal growths and rebalancing the hormone production levels. You can also use medication such as Methimazole/Tapazole tablets to decrease the level of thyroid hormone in your cat’s blood. As mentioned, the above should be done only under the advice of your vet. On a day-to-day basis, you will need to manage their condition. By far, the best step for any concerned owner is to look at changing their diet. Take a look at the cat food recommendations above on what can a hyperthyroid cat eat. Final Thoughts: What Can a Hyperthyroid Cat Eat? Of all the food products related to what hyperthyroid cats can eat, you should note that none are able to cure the condition! Talk to your vet and choose a cat food brand that’s right for your cat. Most hyperthyroid cat foods aim to regulate and maintain health while your cat is hyperthyroid and reverse imbalances in their body constitution and hormone levels. For cures and solutions, surgery and medication are the way forward. Your vet will be able to advise you on the steps necessary to potentially rid your cat of hyperthyroidism. Remember, first consult your vet. Then choose a food fit for your hyperthyroid cat.